If you control a monster that is not a "Burning Abyss" monster, destroy this card. You can only use 1 of the following effects of "Alich, Malebranche of the Burning Abyss" per turn, and only once that.. When this face-down Defense Position card is attacked by your opponents monster, you can make 1 opponents monster (except the attacking monster) be attacked instead. While this card is face-up on the .. Cannot be Special Summoned. Requires 3 "Qli" monsters to Normal Summon/Set. If this card is Normal Summoned/Set, it is unaffected by Spell/Trap effects and by activated effects from any monster whose ..
"Summoned Skull" + "Red-Eyes B. Dragon".. 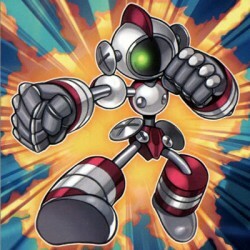 If your opponent's monster attacks this face-down Defense Position card, this card becomes an Equip Card equipped to the attacking monster, without applying damage calculation. Destroy the equipped mo.. Your opponent cannot target Insect-Type monsters for attacks, except this one. If this card is Special Summoned: You can Special Summon 1 "Block Spider" from your Deck. You can only use this effect of.. This card cannot be Normal Summoned or Set. This card can only be Special Summoned while you control "Toon World". You can Speial Summon this card from your hand (Tributes are required if it is Level .. If you control a monster that is not a "Burning Abyss" monster, destroy this card. You can only use 1 of the following effects of "Calcab, Malebranche of the Burning Abyss" per turn, and only once tha.. This card can be treated as 2 Tributes for the Tribute Summon of a Fairy-Type monster. After this card is Special Summoned to your side of the field, you can Normal Summon 1 "Melodious" monster during..